You are invited to join our two families on a summer vacation in the 1950s as we made a road trip from Wisconsin to South Dakota. Many pictures were taken and can be brought to life once again from a photo album / scrapbook assembled by my Dad after the trip was finished. My Dad made notes of what we did each day and not only included photos of our adventures, but also collected brochures, maps, postcards and the like to embellish the black pages of the old leather bound and embossed scrapbook tied together with a shoelace type of assembly. It is a family treasure and a wonderful remembrance of that particular vacation trip. My youngest brother and youngest cousin stayed at home in Oconomowoc with my grandparents who volunteered to keep and entertain them for the duration of this vacation trip that our two families had decided to take. Dad and my Uncle Russ drove their cars in tandem and kept within sight of one another. Remember...this was long before the days of cell phones! So if a stop was necessary along the way, hand signals and car lights would have been flashed to communicate between the two families in the automobiles. Mother and my Aunt Marge were responsible for the food preparation and we enjoyed many picnics along the way. The notes jotted down by my Dad and taken from the scrapbook will henceforth be in quotes. "Left home at 4 A.M. Saturday, August 4, 1956. Stopped for breakfast at Pettibone Park in Minnesota across the Mississippi River from LaCrosse at 8 A.M. Arrived in Fairmont, Minnesota at 1 P.M. Stopped to eat lunch on the banks of Temperance Lake. Arrived at Mitchell, South Dakota at 5:30 P.M. Rented cottage, ate supper, showered and hit the sack early. Sunday got up at 5 A.M., ate breakfast and went to church (7:00 Mass) at Holy Family Catholic Church. After church went to see the Corn Palace. Entire front of building covered with different colored corn and grains." 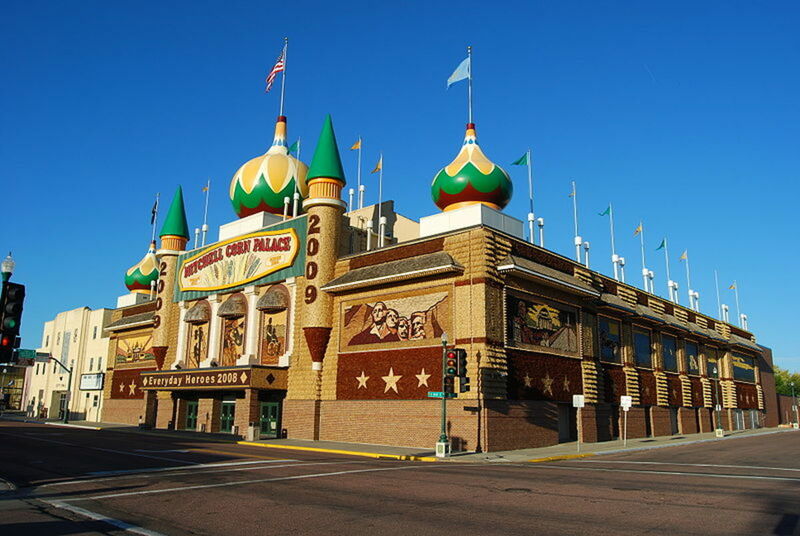 The original Corn Palace was constructed in 1892 and was built of wood entirely covered with corn. Another building like the first was built in 1905. The present structure built of brick and embellished with corn and other grains in artistic patterns that change annually was erected in 1921. 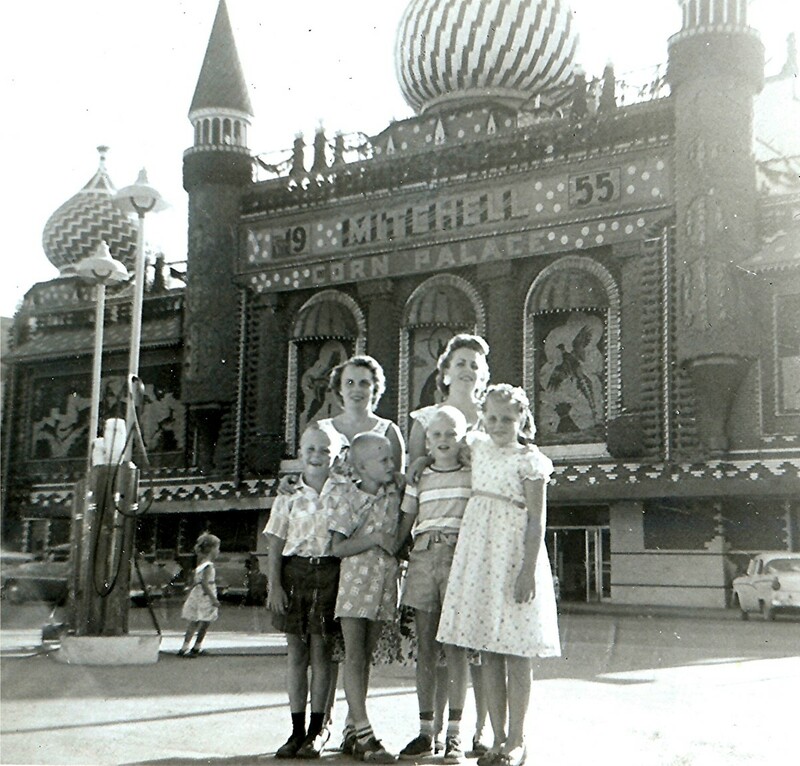 In the brochure my Dad picked up in 1956, it stated that the annual cost of redecorating the Corn Palace each year stood at $15,000. According to the Wikipedia account above, that cost has now ballooned to approximately $130,000. Not only is this Corn Palace a major tourist attraction for this part of the country, but the half block square building houses conventions, basketball games, stage shows and many other events throughout the year. "Left Mitchell, South Dakota at 8:30 A.M. Sunday. Crossed Missouri River just west of Chamberlain, South Dakota at 10 A.M."
"After leaving the Missouri River we were amazed at the shortage of trees. The land is very barren. Lots of waste land. Stopped at Kodoki, South Dakota at 11:30 A.M. Ate lunch alongside a railroad track at a freight station. Not much of a place but it did have trees for shade. All other waysides consist of an outhouse and a wood shelter to eat under. Weather very hot. Arrived in Bad Lands, South Dakota at 1 P.M. Took a number of pictures. Wish we would have had colored film as we thought the Bad Land Rock Formations were beautifully colored." 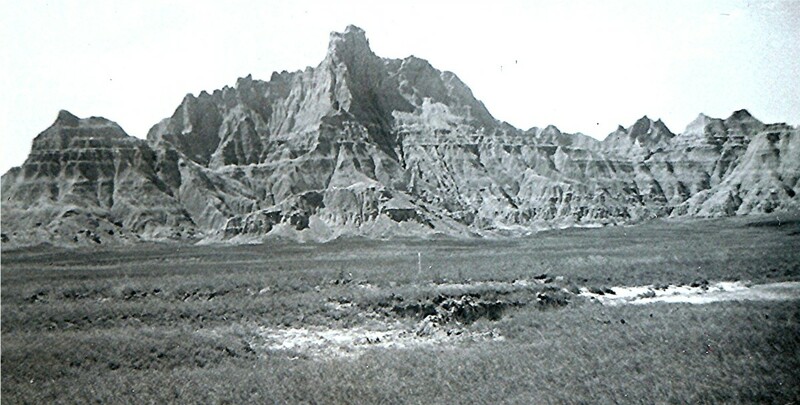 "Left the Badlands at 2:45 P.M. Arrived at Rapid City at 4 P.M. Picked up lots of maps & literature about the Black Hills. Decided to locate at Hill City in the heart of the Black Hills. Arrived in Hill City at 5 P.M.
After looking at different cabins we decided to take the cabins at Pine Rest Motel. Time 6 P.M. Rented a double cabin in a beautiful setting with a play area for the children which they enjoyed very much. The owners were very nice to us." "Children's play area right next to our cabin. Children received mail every day in the mailbox in the play area from the owners of the cabins." "Monday, August 5, 1956. Left cabin at 9:30 A.M. First stop...Mount Rushmore." Mount Rushmore is one of the main attractions for visitors to South Dakota. 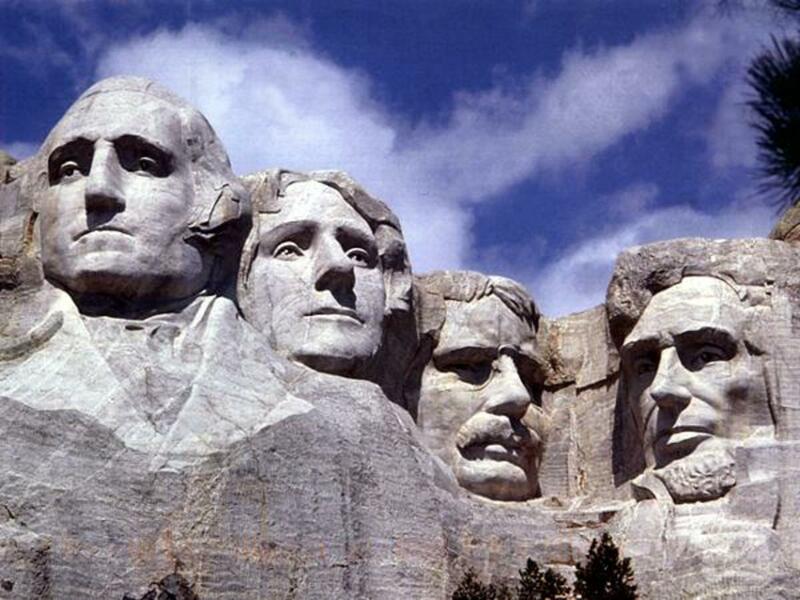 The four former Presidents of the United States that have their likenesses carved into the solid granite walls of this mountain are George Washington, Thomas Jefferson, Theodore Roosevelt and Abraham Lincoln. From chin to forehead each face measures about 60 feet in height. These particular Presidents were chosen to be honored because of the place that they have in American history in developing our democratic form of government. 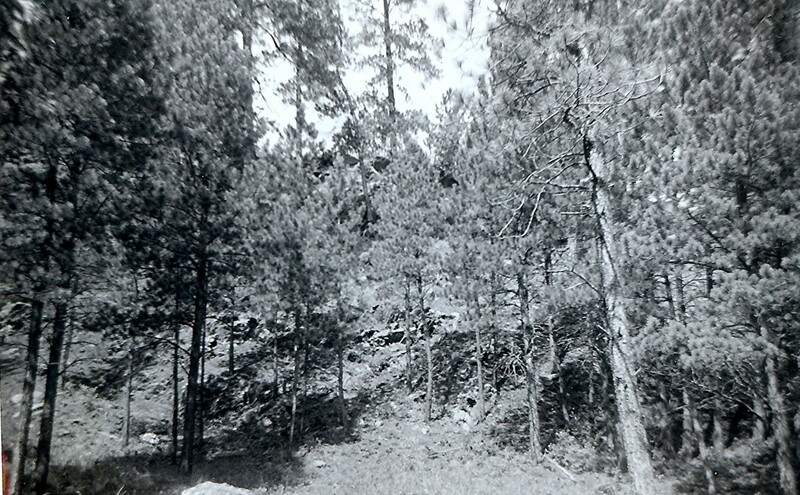 Congress appropriated the funding and set aside the land within the Harney National Forest for this monument to be built. Gutzon Borglum, a noted sculptor was chosen to execute the monument and began his work in 1927. He worked on it sporadically over a total of about 14 years but died just prior to its completion. His son, Lincoln Borglum finished what we see there today. "After Mount Rushmore we stopped at the small town of Keystone. The girls enjoyed shopping for Indian costume jewelry. The kids got a big bang out of having their pictures taken with an Indian in front of his Tepee. He gave the kids a real line about how he fought white soldiers and took over as the chief of the tribe from Chief Crazy Horse. From Keystone we went to Rushmore Cave and took the tour through the cave which took one hour. Huge cave kept in natural state. Lots of climbing." "We next stopped at the Cosmos, a place that defies the Laws of Gravity. After the Cosmos we had lunch. Then on through the Black Hills National Forest. Next stop...Rockerville Gold Town. The town is preserved from the Gold Rush Days. Also had a tent theatre. Very interesting. Kids spent most of their time in Rockerville talking to an Indian family living in a Tepee." "Next stop was the Reptile Gardens. Snakes of all kinds. Watched them milk a rattlesnake. They let us pet a tame South American Boa. Held up by a hailstorm when we wanted to leave. In parts of the Black Hills they had hail stones the size of baseballs. Wouldn't have believed it if we hadn't seen them ourselves. Next on Skyline Drive to the Petrified Forest and to Dinosaur Park which was on top of a hill overlooking Rapid City, South Dakota. Enough for one day and so back to the cabin and get ready for tomorrow." Left the cabins at 8 A.M. for another day of travel. On to Scenic Drive Highway # 85A. Almost too beautiful to describe! Pigtail curves, beautiful bridges, tunnels through rock formations. A lot of hill climbing. At top of hill at Lookout Point one would guess the ability to see 80 or 90 miles away looking down onto beautiful valleys, etc. 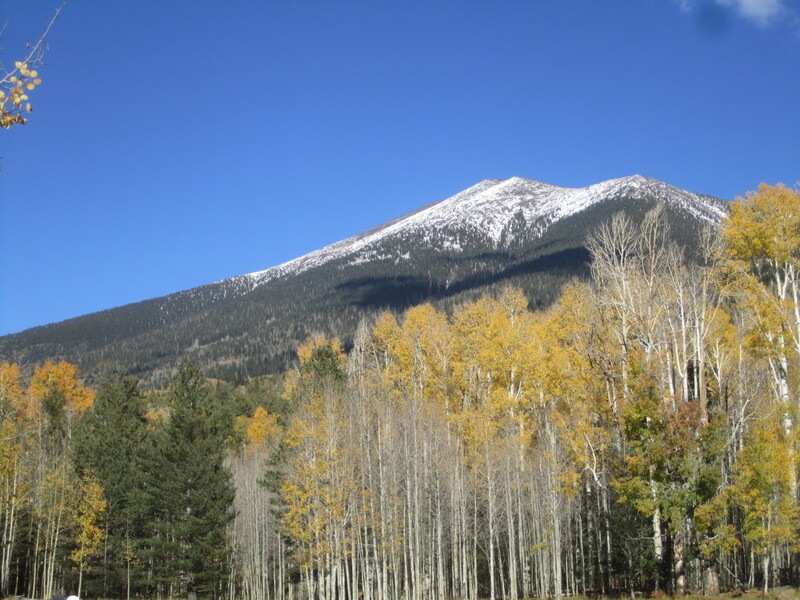 From this drive we drove through Nordbeck Wild Life Preserve." 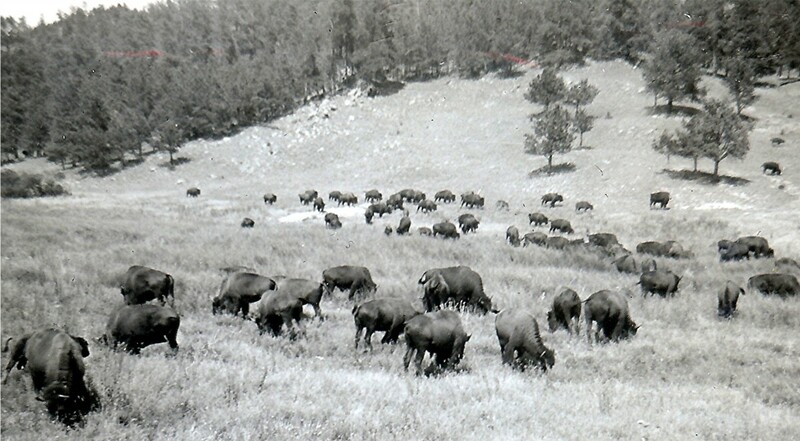 "At about 9:30 A.M. we entered Custer State Park looking for buffalo. Had to stop along road because of little burros in the road. They were very tame. They ate cookies out of our hands and then would come over to the car and stick their heads into the windows looking for more hand-outs. These burros seem to be on the loose all over this area as we saw them a number of times." "Next stopped at Last Frontier Game Lodge. Took about a 1 hour horse back ride back into the hills. Left there and stopped at campsite for lunch. Beautiful spot. River running through it with solid rock walls on opposite side of the river. Water so clear you could drink it. All pine and birch trees. Would love to camp in this spot for a couple of weeks at some later date." "Next we drove up to the top of Mount Coolidge. Went up into the observatory and we could see for many miles in all directions." "Continued on through Custer State Park. Saw three separate herds of buffalo. Drove on into Wind Cave National Park. Saw one lone deer so far. Saw more buffalo then stopped at Prairie Dog Town. Lots of little prairie dogs - cute little fellows. We then came upon a spot where they were feeding the buffalo. They were all over the road and on both sides. We got some real good pictures here. Two of the big bulls had a fight the day before. One was killed and the other bull (which we have a picture of) was really scarred up and beaten up pretty badly." "We then drove through Hot Springs. From there we took a back road to circle back to Hill City. Stopped at Roses Hitching Post Tavern in the small town of Pringle. Had a couple of beers. Pretty dry. Next drove into Custer and then stopped at Fairyland Zoo. 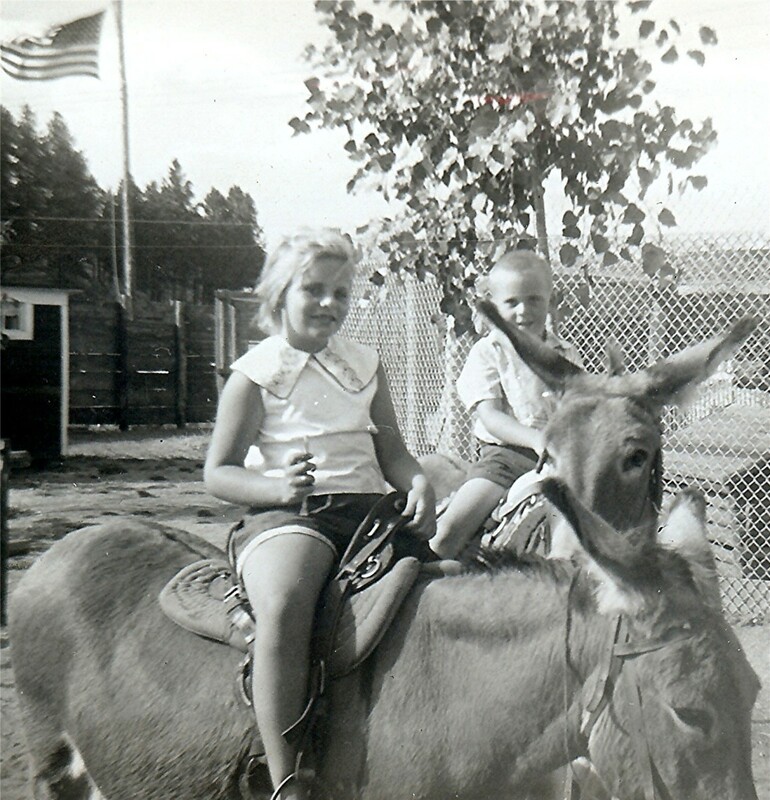 The kids all took rides on little donkeys." "On way back to cabin we stopped at another beautiful campsite at Stockade Lake. Heading back through part of Scenic Drive # 85A from the other direction. Driving through the Needles Highway. Stopped and took a picture of the kids but it is almost getting too late for pictures. We could see a couple of mountain goats up in the stone formations. Next stopped at Sylvan Lake Hotel then down to Sylvan Lake. Beautiful. Took a walk through sheer high rock on narrow footbridge down to the dam on one end of the lake. Getting too dark for pictures. Couldn't stay long as it is getting late and it is suppertime. 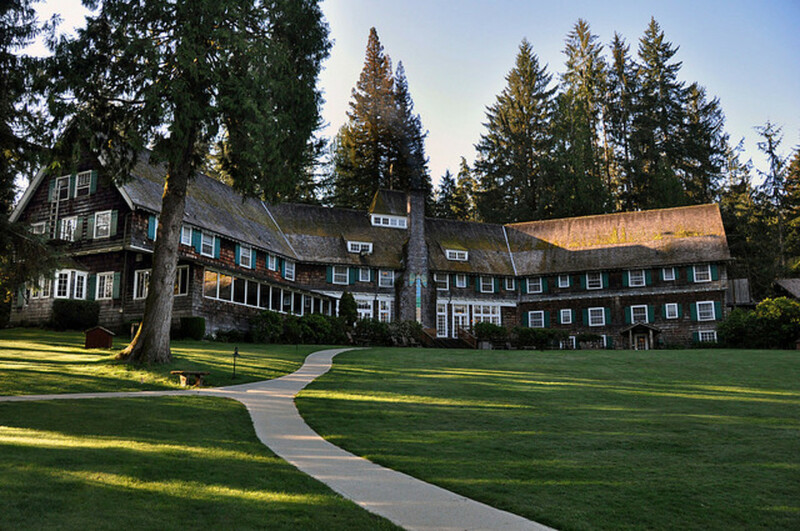 Left there and arrived at cabins at 6:30 P.M. to end a most pleasant day." Left the cabin at 7:15 A.MDriving along saw lots of goats along the road. Passed Sheridan Lake. All beautiful country. Next...Thunderhead Falls." "We saw lots of petrified logs and more burros along the road. We also saw many old covered wagons and many old stone chimneys where cabins had been burned down. Must be still from old pioneer days. 8:20 A.M. coming into lead and old mining town. Next town...Deadwood. Passed monument where Preacher Smith was killed by Indians. Next stop...Black Hills Airport where we met "Doc" (an old Army buddy of mine). We pulled up there just in time to see him land. He has his own airplanes. 9:25 A.M....entering Wyoming. Lots of red rock and red earth. Next town...Sundance, Wyoming. Stopped for a beer and talked over old Army days. Next...Sundance Mountain. Entering Black Hills National Park, Wyoming. Bear Lodge Country. Lots of sage brush." "Now entering Devils Tower State Park. Passed another Prairie Dog Town. Saw them by the hundreds. They beg for food all along the road. We had lunch in the park at the base of Devils Tower. After lunch we walked along the footpath at the base of the tower and took pictures." 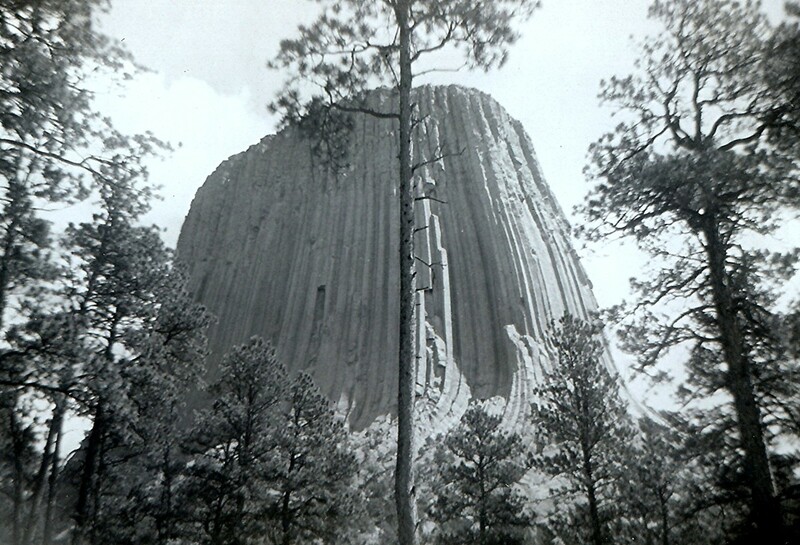 "Left Devils Tower at 12:00 Noon. Stopped in town named Hulett, Wyoming. Cowboys all over the place. The country around here is beautiful. High hills the color of salmon sprinkled with pine trees. Passed wealthy ranches that have sprinkling systems running on wheels across their acreage. We see big herds of sheep. Saw a black eagle. Ranches about every 10 to 15 miles apart. Came into a small town by the name of Alzada, Montana. Heading back toward Spearfish. Saw quite a few small herds of antelope. Stopped in Belle Fourche, South Dakota for a little while. Next arrived in Spearfish. Went to see Passion Play arena. Couldn't stay for play as it starts too late and it's a long drive back to Hill City. Went back to airport to see Doc off. We all went out on the field to watch him take off in his airplane." "Left airport for drive through Spearfish Canyon. Stopped at Bridalveil Falls. Crossed the river and climbed up to rock at base of the Falls to take pictures. The canyon is beautiful. Trout stream running all along the canyon. We saw deer along the stream." "Next stopped to see the Chair Lift at Terry Peak in Lead, South Dakota. Couldn't get anyone to go up. We then stopped at the Inferno and had a beer. It is a tavern made from an old gold mine. Terrific. Back through Lead where they still have an active "Homestake Gold Mine." Stopped to buy souvenirs at a jewelry factory then back to cabin at Hill City. Arrived at cabin at 7:15 P.M. Busy day." Left the cabin late as we are going to take it easy today and rest up for our trip back home tomorrow. Went out to the monument of Chief Crazy Horse. The monument is in the 7th year of a 30 year project. The sculptor "Korczak Ziolkowski" has only one man to help him. It is all donated time so they have a herd of dairy cows to make a living on. The name of the mountain is Thunderhead Mountain." "In the evening we went over to our cabin owners who have a driftwood shop. We bought all kinds of stuff. The one daughter picks up all these pieces of driftwood up in the hills and then during the winter months makes up all of the different pieces and finishes them. She is a real artist. Some of the pieces are just beautiful." Heading for home. Left cabin at 3 A.M. Went about 3 miles when we saw a big buck deer on road. Through Custer, Pringle and part of Wind Cave National Park. While in park we came upon a whole herd of big elk right next to the road on both sides. Next into Hot Springs where we see lots of range cattle. Drove through Slim Butte country. Right here looks like a miniature Badlands. Next town Oglala in Indian Reservation. A big share of their houses were log cabins. It is the Pine Ridge Indian Reservation. 5:40 A.M. crossed state line into Nebraska then back into South Dakota. Came upon spot up on hillside where Indians hold Sundance Ceremony. Big Catholic Missions and several Catholic churches throughout reservation. The homes are just shacks and all wasteland. Makes you wonder how they can make a living there. A few beef cattle but is seems they gave the Indians the lousiest land they could find for their reservation. Next arrived at Mission, South Dakota. The girls had to stop and buy more Indian jewelry." 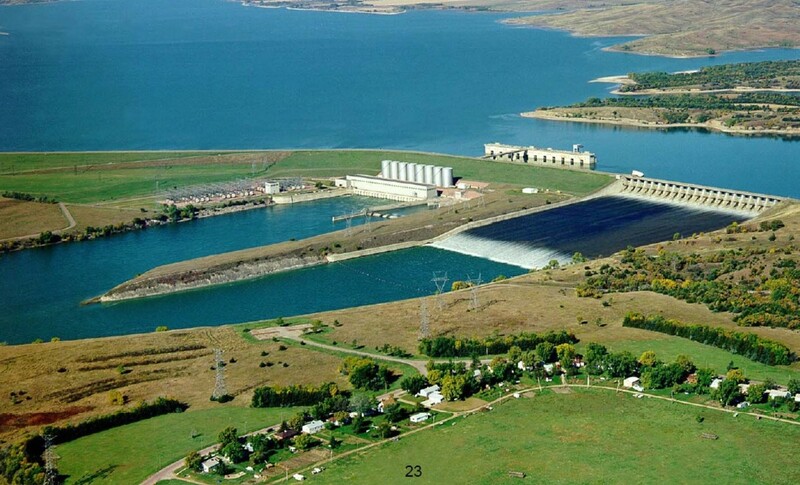 Passed Fort Randall Dam - dedication next day. Stopped at wayside along the bank of a river just outside Olivet. Left South Dakota at 2:00 P.M. and crossed into Iowa. Arrived at Mason City, Iowa at 5:45 P.M at a motel. Went out to eat at a fancy restaurant called Costos. Had a most wonderful Pike dinner. Then hit the sack for an early start tomorrow. Anxious to get home now." Left Mason City at 5:30 A.M. Drove quite a ways before we stopped at a little church yard and had breakfast. A terrific lack of waysides in Iowa. Not too far out of Mason City we saw a big buffalo ranch. Went through Claremont then to McGregor, Iowa and crossed the Mississippi River into Praire du Chein, Wisconsin at 8:30 A.M. Took Highway 14 and Marge and Russ stopped in Madison to unload. We kept on going and arrived home at 12:00 Noon to end a most wonderful vacation." This is the end of my Dad's noted descriptions from our South Dakota vacation trip. Also attached to the pages of the scrapbook are a number of postcards which are not featured here as they are glued to the black pages and I cannot check them for copyrights. Numerous maps and brochures are also included in the scrapbook in addition to the pictures. This was our two family's first major trip taken together and what the pages do not tell is the fun we had singing in the cars as the miles passed under the rolling tires. To save money most of our meals were eaten picnic style prepared by our mothers. 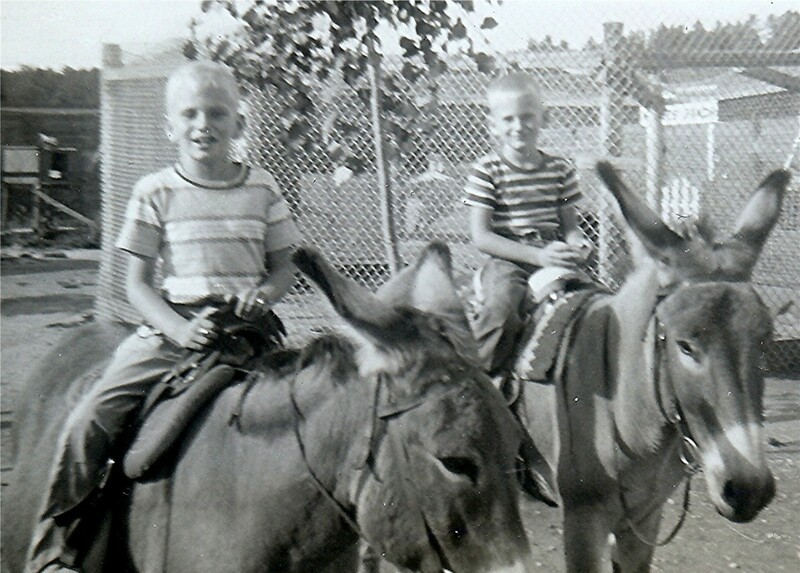 Quite often we kids would switch cars and spend time riding with our cousins. Our two families were very close and often did things together starting with our parent's double wedding...double honeymoon...and numerous weekends and summer outings spent together. As the eldest of the "kids" and at the ripe old age of nine years wonderful memories were created. That being said I would love to go back and take in those majestic South Dakota landscapes as an adult. Much fun would be had with my digital camera today! My cousin's family have been able to retrace their steps with the addition of their youngest son joining them on that trip. 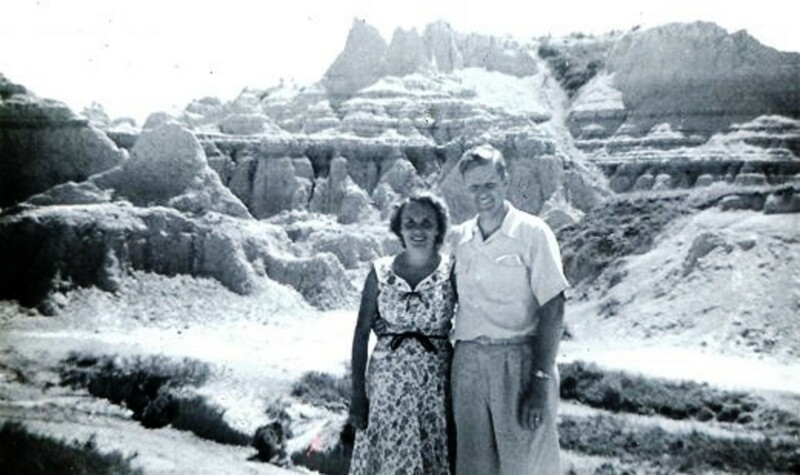 Since my parents moved to Texas a few years after this vacation we never made it back to South Dakota to once again view such sites as the Black Hills, Badlands, Mount Rushmore and other wondrous areas touched upon in this article. 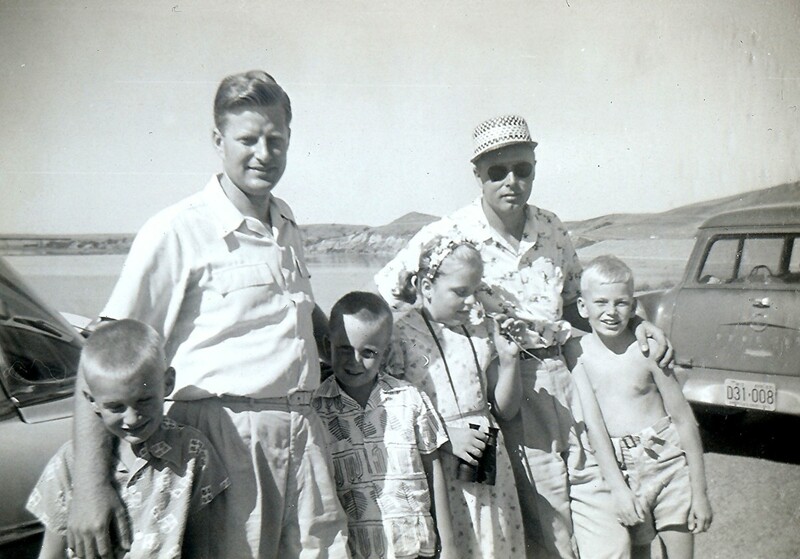 Hope you enjoyed going back to the 1950s, viewing family pictures and tagging along with us on this South Dakota road trip as much as I have had fun in reliving it by writing about this particular vacation. Have you ever been to South Dakota? Location of South Dakota in the U.S. Always handy to have a map in the car! I still like looking at maps when planning trips much less when I am on a trip. It is great when a family plans together like that. 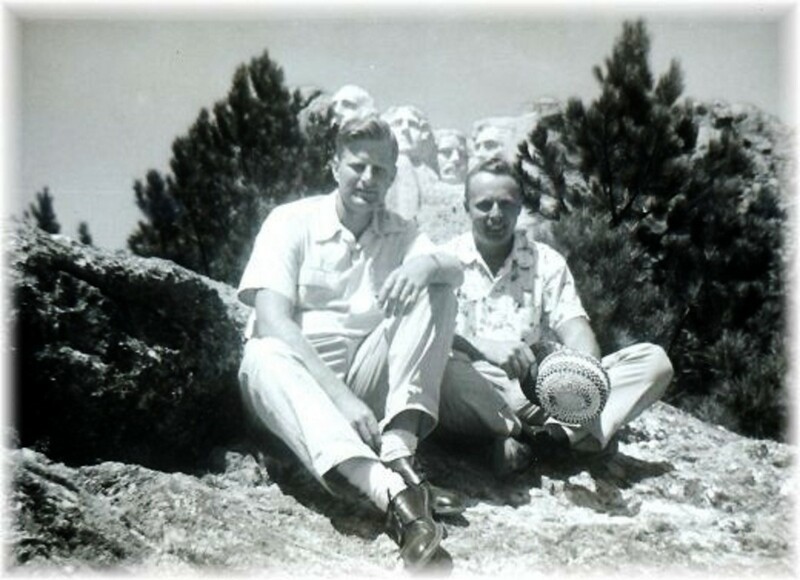 I am happy to be able to share this South Dakota vacation trip of long ago with you. There are so many unique places to visit in that state. This is very interesting! Thanks for sharing the story about your South Dakota vacation. I am sure that my parents, as well as my aunt and uncle, put a lot of thought into the planning of this trip. My grandparents were also involved since they kept the youngest of the children from both families during the duration of this vacation trip. Fun was had by everyone and lasting memories were made. Did everything just seem to pull together to make this trip happen? Many of my long road trips were in later years well past childhood. What made this particular trip even more special was sharing it with not only my family but extended family members as well. It was memorable in so many ways. Yes, it seems you had a wonderful trip. You have had many family vacations that involved long road travel. That is a shame that your nephews did not remember the trip that you treated them to. We did a lot of singing in the car, looked for different state license plates, tried to identify the different types of cars, etc. as we were traveling. It was also our first major family trip. We also had snacks in the car and stopped to make lunches along the way. I definitely remember it and fondly. I am glad you remember it. Two of our nephews came to visit us when they were in their early teens. We took them to many places. When they came back a decade later they didn't remember any of it. I am truly lucky that my dad made that scrapbook/photo album. I remember that South Dakota trip very well. It was so much fun! Those vintage pictures are awesome. The one at the top of the article would make a good postcard. An excellent article. It's fantastic your father took such detailed notes. Curiosity, how much of this trip do you remember? Thank you so much for your comment. 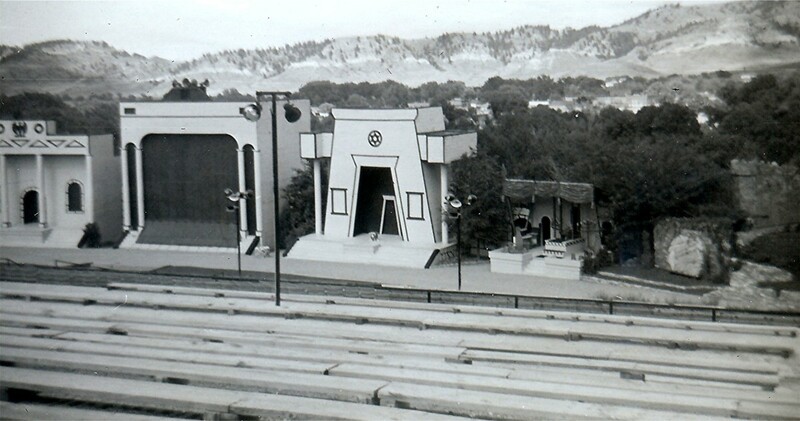 You would certainly know this area well because of your family owning a motel back in the 50s and 60s in Rapid City, SD. It sounds as though your family truly added to the wonderful experience of visitors to that motel in a personal way. I agree that returning would be ideal because of so much to see. My aunt and uncle and their children did so several times. My family would probably have done the same except that we moved to Texas not too long a time after that trip. So nice that your daughter and her family are retracing their steps with a vacation road trip in that area. Yes road trips are great! Thanks again for your comment! 'Thoroughly enjoyed sharing your family's vacation vicariously! 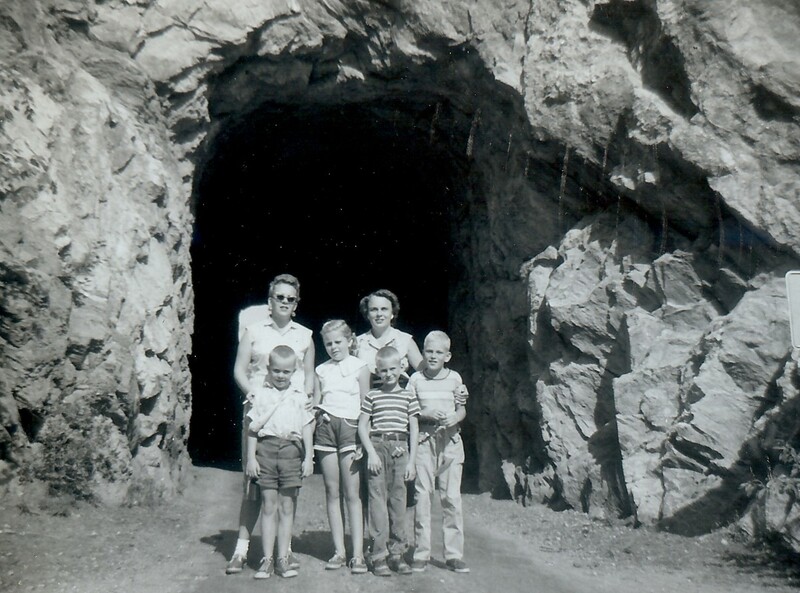 My family owned a motel (Motel Tradewinds) in Rapid City SD during the 50s and 60s, and we loved to make maps for our guests of all the wonderful things to see and do in the beautiful Black Hills and Badlands! We often made friends (and pen pals) with children staying there for a couple of weeks. Many would make annual trips because there was too much to take in in one trip. The area has become a permanent home to many retirees who once visited there in their younger years, or were stationed in the Air Force at Ellsworth AFB. My 40-year-old daughter and her family are making relatively the same trip this week as your family did, to re-live fond memories of her youth visiting grandparents and great grandparents. 'Nothing like a road trip! It truly was a trip of a lifetime for me and although I was a child, I have fond memories of it. So glad we have these pictures and my dad's notations. It brings the trip back to life every time I view it and get to remember. Glad you also liked it. What a joy it must have been to have lived there and get to ride dirt bikes for endless miles in that kind of scenery! Thanks for your comment and good thoughts. Appreciate it. Great Hub Peggy. I lived in South Dakota and visited these places. It was an awesome place to camp and hike besides doing the tourist sites. We used to ride our dirt bikes for miles and miles and miles. What great memories to have. I love the old black and white photos. 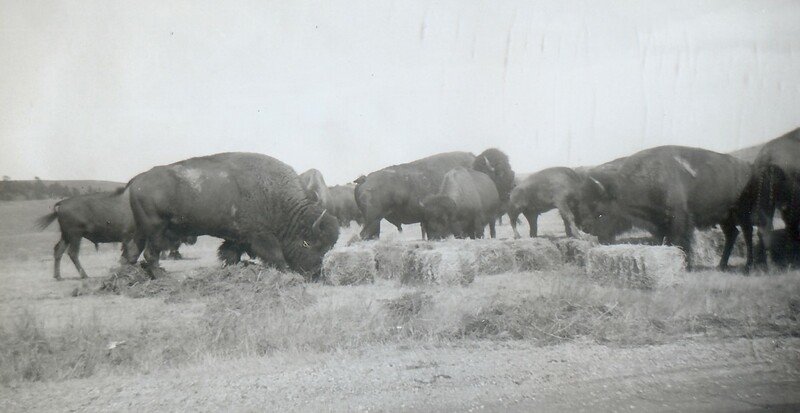 It looks as if Custer State Park has stayed the same over the years with the burros and the bison. Wonderful hub - voted up, interesting and awesome! That was the longest trip we had taken as a family at that time and I still remember it fondly. My aunt, uncle and cousins have all returned to the same areas as adults. I would enjoy doing that also someday. The next major trip we took as a family was to Niagra Falls (Canadian and U.S. side, New York and New Jersey where another aunt, uncle and cousins lived. Unfortunately a semi-truck driver fell asleep at the wheel and crashed into my parents travel trailer and car on the New Jersey turnpike as we had just headed out to return to our home in Wisconsin. We all survived but it certainly changed our lives! Glad that you enjoyed this South Dakota Road Trip from the 1950's. Appreciate your vote and the share. 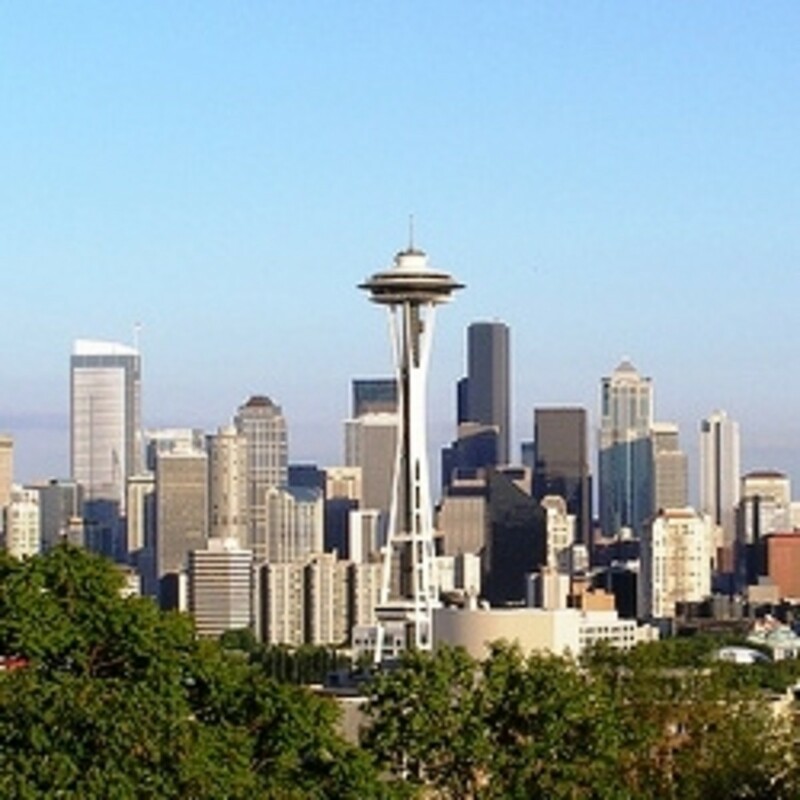 I always enjoy reading your travel Hubs, and I have to tell you, this is one of my favorites. What wonderful memories you must have making this kind of trip with the two families and the children. I loved your photos (you were quite a cute kid!). This Hub has kept me entertained for about 45 min. Voted UP, and certainly shared. 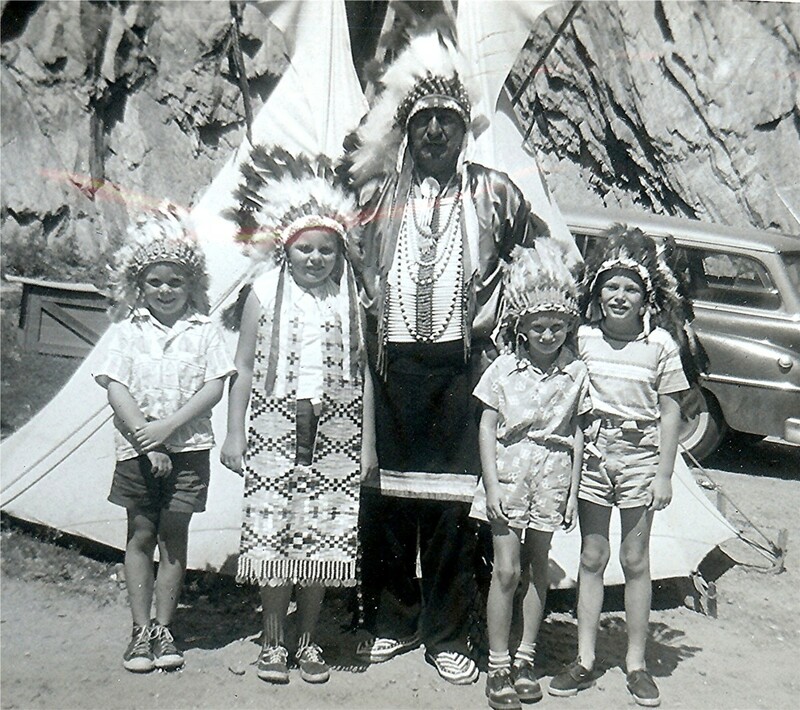 My aunt, uncle and cousins who accompanied us on that trip to South Dakota have been back several times plus with their youngest child even after all the "kids" were adults. I would enjoy seeing these same sites as an adult and would probably enjoy it all the more. It is an amazing kaleidoscope of interesting places and fantastic scenery. Thanks for your comment & especially the share. Talk about the memories! And how about that little Peggy smelling the sunflower! Another super enjoyable hub here--what wonderful pictures and your dad keeping the travel diary. This was certainly a vacation to remember--my all the cool places to visit in S. Dakota -Wyoming- and that goes for the here and now too! Most pleased to share! 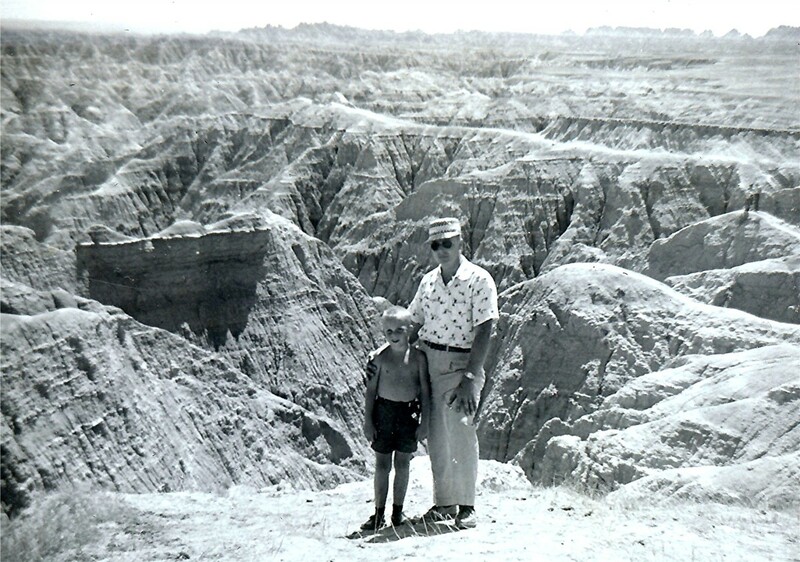 I was just a kid on that family road trip to the Black Hills and other places in South Dakota in the 1950's but remember that my Dad liked driving a Pontiac. Not sure what model year it was. My uncle preferred driving Ford cars. As to which highway I preferred, I liked everything that we were viewing but remember the Needles Highway as being spectacular scenery. See the video in this hub and see if you agree as to the scenery. Mount Rushmore was a highlight! Thanks for your comment. I throughly enjoyed it. I am 31 years of age, an old soul, and could feel that experience along the sedan, which was what year and make? What was your favorite place and highway to drive on. 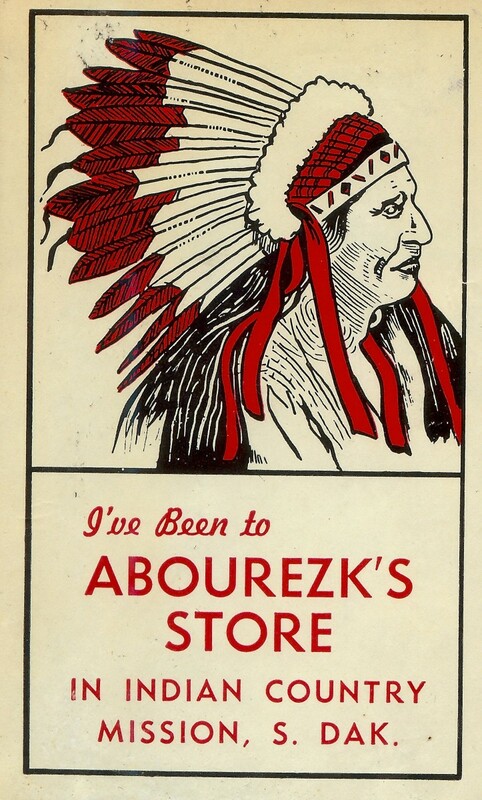 So nice to know that you enjoyed this travelogue & photos from many years ago visiting sites in South Dakota. Appreciate your comment and votes. Thanks! This is so detailed and well put together, it sounds like such an adventure. The pictures are a great additive as well. Voted up and awesome. I know! My aunt, uncle and cousins who live further north have gone back several times. 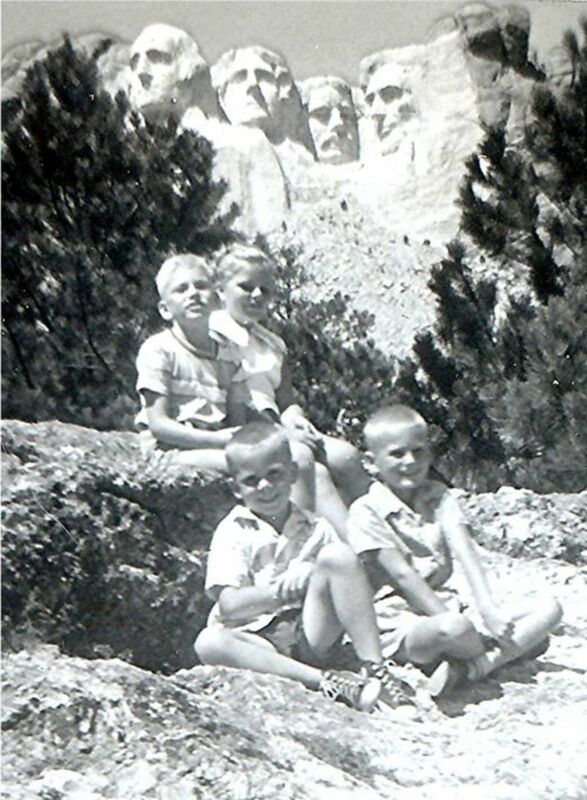 My husband also visited the the Black Hills and other areas in South Dakota as a child. Would be fun for both of us to see again from a different perspective. Thanks for the comment. You really ought to go back again...you would be amazed to see how things have changed! Lovely hub and lovely memories!! Oh my! That would be a dream for many people to be able to travel for 6 months and see 34 states in that time. You are lucky! Can't wait to read about it. 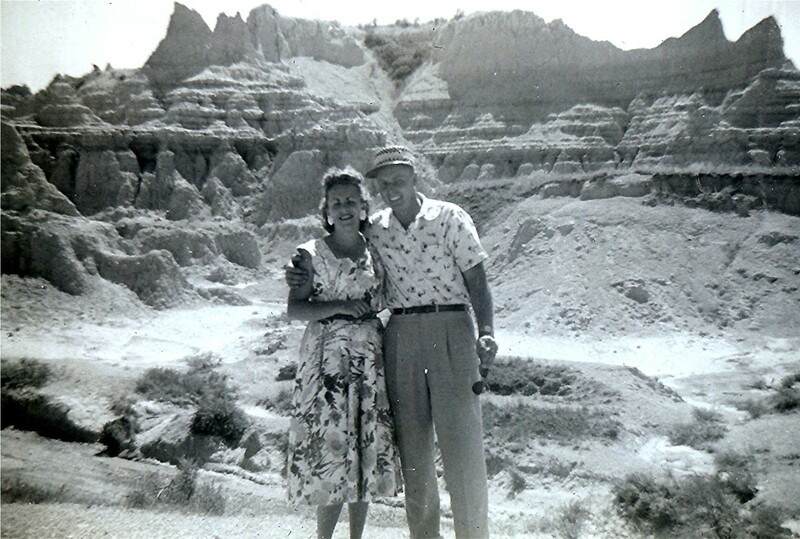 Thanks for leaving a comment on this South Dakota road trip article dating back to the 1950's. Great post about your trip in 1950, my wife and I did a 6 month trip in 2009 visiting 34 States and what a great country it is to travel in.Posting out trip! 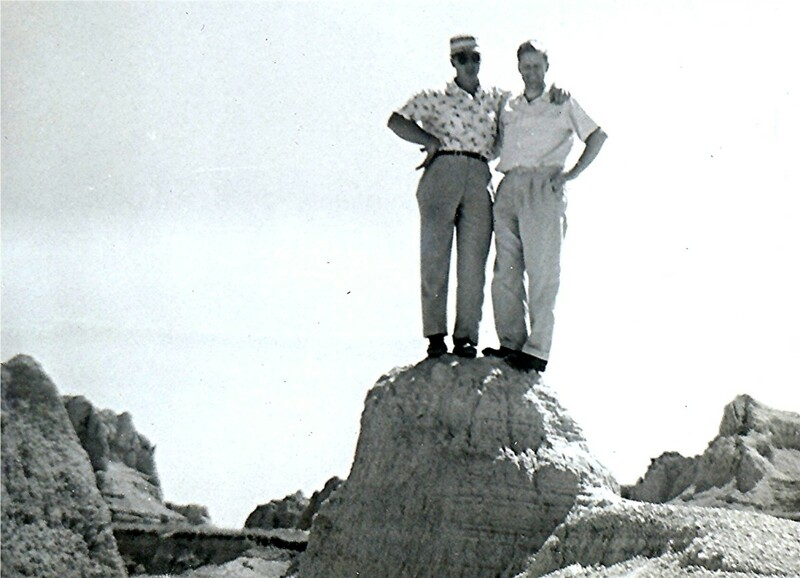 So happy to hear that you enjoyed this hub about our South Dakota Road trip back in the 1950's. It makes for some fond memories! Appreciate your comment. Wonderful peek into the history. I absolutely loved your work. These are good pictures considering what cameras were like back then and I know it would not have been an expensive one that my Dad had. So we really were pretty close to those buffalo! Glad that you enjoyed this South Dakota Road Trip of the Black Hills and elsewhere. All the videos worked for me. Crazy glitch probably, but thanks for the heads up. Appreciate it, your comment and votes. Can you give me a hint? What parts of the country will you be showcasing in your hubs going back to doing road trips with your family? Anything from South Dakota? Thanks, Peggy. I am slowly cataloging and writing about them. i'll keep u posted! 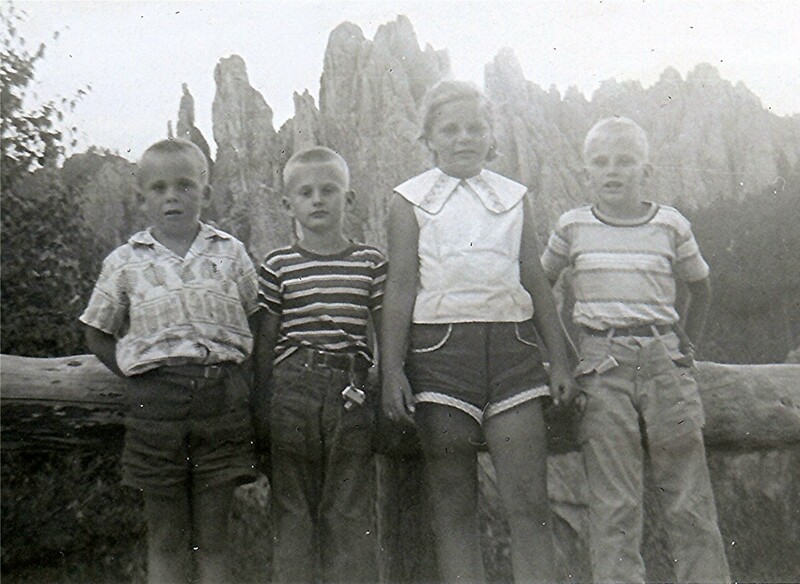 You must have been quite young if you are not sure if you accompanied your parents on a road trip to South Dakota. I think that if you just start the process of writing about your road trips, you will enjoy it. It certainly brings back memories...at least for me. And by doing research, I sometimes continue to learn things about the places that I have visited in the past. That is always fun! Peggy, I'm working on a story about a road trip I took on my own several years ago, but I rarely have the inspiration to write it. I do think I've been to South Dakota, though I'd have to ask my parents for sure! From what you said, you have many road trip adventures to share with us. You will have to get busy and write them! :)) Were any of them in South Dakota and did you get to see Mount Rushmore or other places featured in this hub? The black and white photos taken back in the 1950's were typical as colored film was much more expensive back then and used less often...at least in our family. South Dakota is filled with some fabulous landscapes. The Chief Crazy Horse monument has progressed some since we were there although it will probably be many lifetimes before it is fully completed. We were talking about it just the other day with some new friends who send donations there every year supporting its eventual completion. Thanks for your comment. Peggy, I do. I just need to post them! I wasn't even born when you made that trip but it's spooky seeing black and white photos from that era and seeing how similar the monuments and landscape is 60 years later. South Dakota looks really empty too. A lot of flat land and wilderness. 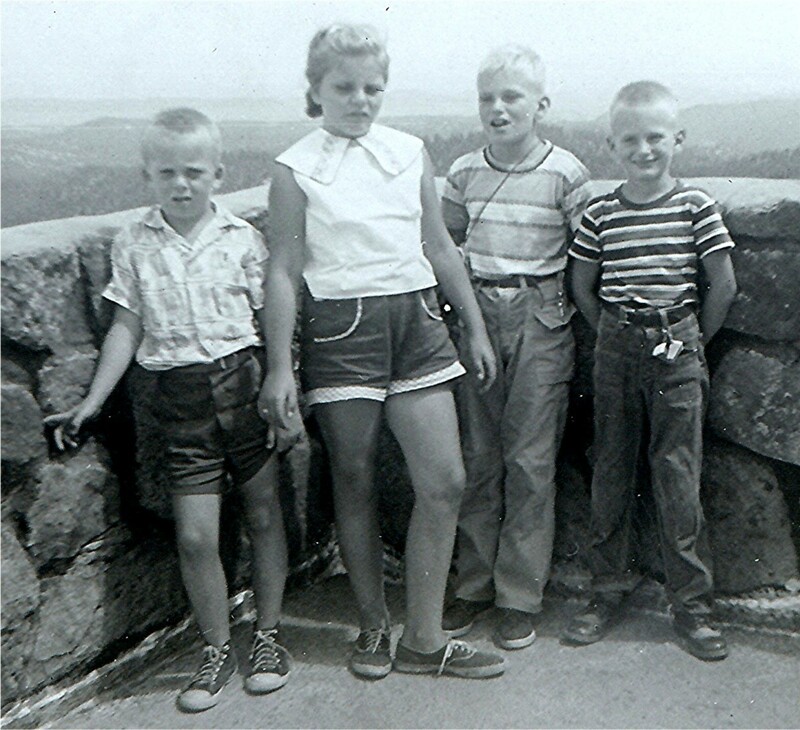 So glad that you enjoyed this nostalgic look at our South Dakota road trip to the Black Hills back in the 1950's. You undoubtedly have many stories and photos to share of your road trip adventures with your family. Thanks for your comment. my family took may road trips growing up (My dad was a musician and we toured with him) and, even though I was born in 1980, these pictures and story brought back a sense of nostalgia and they also reminded me of looking through my grandfather's photo albums. very good hub! Well done! Guess the heads of the Presidents on Mount Rushmore showed up more. Haha! Glad to hear that you enjoyed this hub and thanks for your comment. I almost couldn't see kids posing under Mount Rushmore. All of you seemed to camouflage with those heads. Very entertaining hub, Peggy. I am definitely glad to have grown up in the 1950's without all the distractions of today. I remember laying in the grass looking up at clouds and guessing the shapes and comparing that with what my mother and brothers thought they resembled. Bet not many people do things like that either today! As to picnic lunches...when my German girlfriend and I took a car trip from Houston to California and back with the focus of visiting State and National Parks, we did do a lot of picnics along the way. Such scenic spots for our repast and it not only saved money but time. No McDonalds will ever take the place of eating in the open air at a picnic table...or even a rock or field located in gorgeous natural settings. I would still choose to do that. 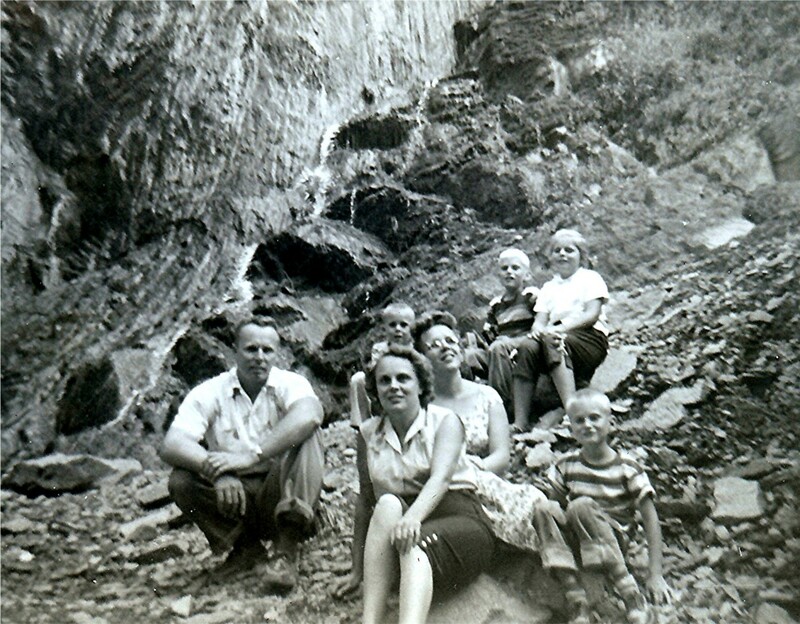 The family photos taken on this vacation trip to South Dakota are undoubtedly considered vintage by now. Ha! Thanks for your comment. You have cute family pictures, Peggy. This hub is very touching and inspiring. 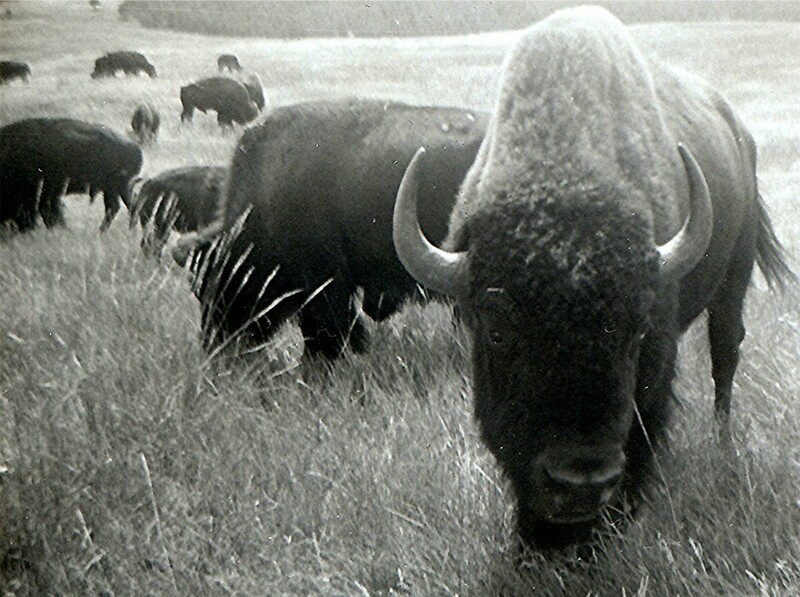 So happy to hear that you enjoyed this hub about our South Dakota road trip taken so many years ago and that it also resurrected memories of your own. Thanks for your comment. I've spent most of my life in South Dakota. Some of your pictures are similar to some I have and they do bring back memories. Great job on the article! Nice that you got to enjoy it as my family and I did back in the 1950's. It certainly made a great impression upon my mind that has lasted through the years. Thanks for taking the time to leave a comment. The pics of Rushmore, helped confirm my memory of 1953 Mt. Rushmore. It was a lot simpler than the entrance is now. I remember a long road that ended at Mt. Rushmore. Ah...the games in the car. Let's see...spotting license plates and writing down the names of the states, counting VW bugs and trying to find an Edsel! ROFLOL So many games to keep us occupied on the long road...no CD players, iPods, laptops, Walkmans or other gadgets. I recall the back of our car looked like a toy store with all the junk! LOL Back then, we used our imaginations and I even remember following the road maps for my dad, telling him when we should turn, etc. Today, I am still good at not getting lost and finding my way. I rarely get lost! The sites were great! The biggest ball of string, those weird animal places with snakes and stuff, historical sites along the highway. This trip would have been in the late 1950's and it was surely fun! As you said..."those WERE the days!" It was a great bonding time for families. No distractions with all of the new electronic equipment that has everyone doing their own thing. We talked; sang; guessed what type of cars we saw on the road and played other games as the miles were traveled. Of course, the sightseeing was also great. Happy that this could bring back happy memories of your trips with your family. Thanks for the comment. Wow, does this bring back some memories of my youth! I passed through S. Dakota on my way to Washington state, and remember the first time I saw the Badlands. Very rugged country. The photos were great and remember dressing like the boys in that picture...our crew cuts, shorts, etc. Although I am a bit younger than you, I do recall the little tourist attractions and mom/pop motels on the roads. 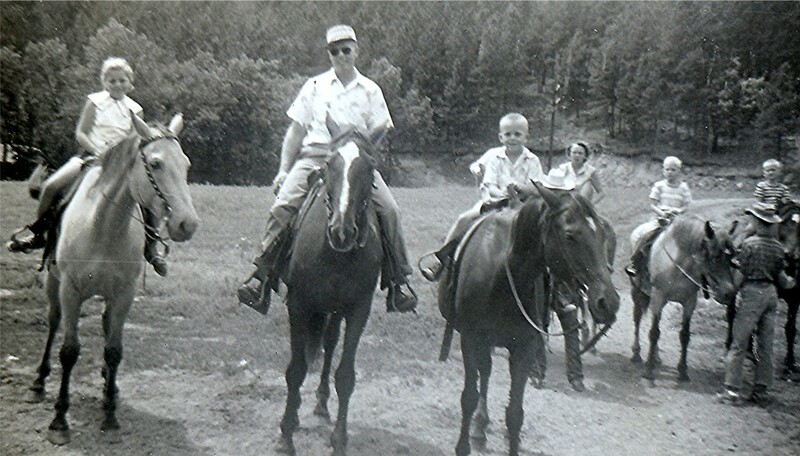 My memories are from the early 1960's and recall several trips to Florida, and also some historical vacations to Chattanooga, Look Out Mountain, Rock City, and various Civil War locations. My parents never did care to go west, for some reason, we always seemed to go south or south east, although after I was an adult, they went to the Grand Canyon. Ah...those WERE the days! Thanks for the memories...wish we could do some of those trips again with our families! Peggy, the main hub picture caught my eye. 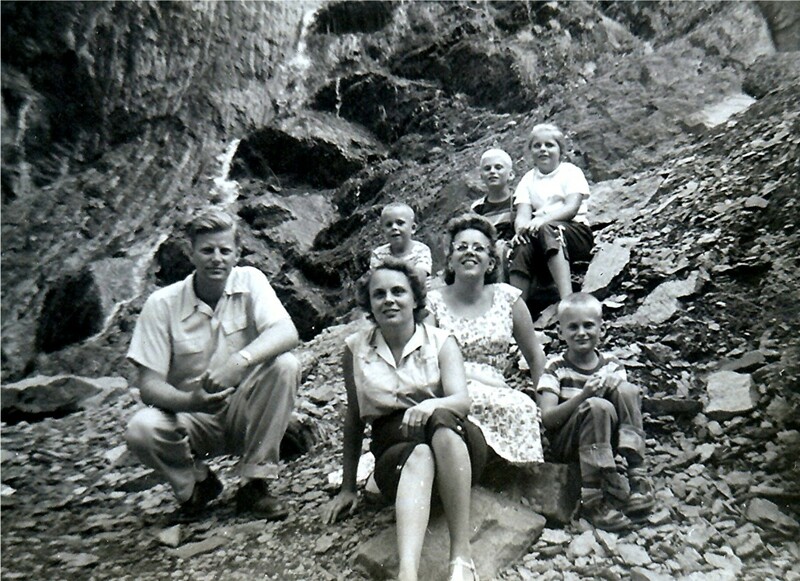 It looks like one of the many vacation pictures of my family growing up - except there were 5 of us - and we often went to the Smokey Mtns and caves on the way to Florida or on boating trips or family picnics at the park. Thanks for the reminder of some pleasant memories of some different times. What a delight to find so complimentary a comment! That must have been a wonderful trip crossing the USA from Boston to Seattle! A German girlfriend and I spent 3 weeks traveling from Houston to California and back seeing mostly National Parks of the U.S. Have written many hubs about that trip but all of those sites would have been south of your travels if you stayed to the north. The Crazy Horse memorial must be a BIT further along than when we saw it. Haha! So happy to hear that you enjoyed this hub, and thanks again for your comment. My partner and I originate from South Africa but live in England... last year we took three months out and did a road trip across the USA, from Boston to Seattle - and along the way absolutely fell in love with South Dakota... It was lovely to see photos - of the very same places that we visited... literally - it's like we were following in your foot steps - just 54 years later... We smiled at the photos of the Crazy Horse Memorial... in your Dad's notes he says that it was year seven of a 30 year project... having visited they are currently saying - having worked on it for 60 years - that children born today MAY see it's completion!!! It would not be a travelogue as much as what your type of business was like back in that era. It would interest me and I am sure it would interest others. I'll give it some thought although my memory is not that good on details of where we went. Sounds like a hub in the making! It would be interesting hearing more about that job and traveling through North and South Dakota back in the 1950's and things you would have experienced while working. How about doing a hub on that subject? About that time I was working as a sales assistant to a dress salesman which meant mostly putting up displays and repacking.I remember the corn palace from then.we traveled much of the Dakotas I recall. I applied for a newspaper job in Rapid City once but didn't get it.Have been to that area several times however. It is so nice that you have memories of visiting South Dakota with your parents and that you are continuing the tradition of making road trips to South Dakota (and probably elsewhere as well) with your wife and kids. Glad that you also liked my family pictures taken back in the 1950's. Take plenty of pictures of your own. They will be treasured someday just like these are by me. Thanks for the comment. Wow! Great pictures! 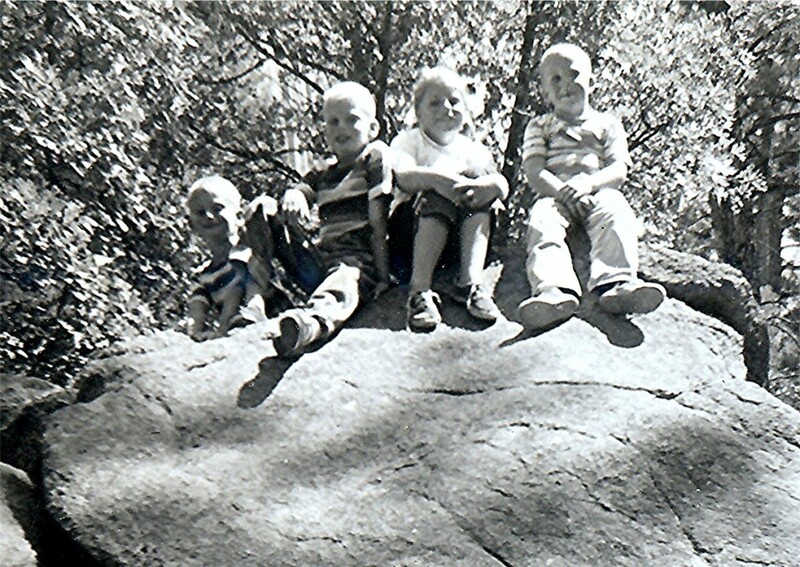 We are from Wisconsin as well and my parents used to take us out to South Dakota on occasion for summer trips. Now my wife, kids and I are continuing the tradition. We went in 2008 and just this past summer, we really like it out there. Liked seeing the pics of places we visited and how they looked in the 50's. So you made a similar trip to South Dakota also in the 1950's! Happy that this could bring back some family memories of your similar road trip. Did your family collect those state stickers and put them on the family vehicle? That was popular back then. thanks for sharing your family's story of the trip to South Dakota. I was 8 when we made the same trip from Oregon to SD in about 1958 in a 1956 Pontiac station wagon with my family. Similar pictures. We went to visit relatives in Mitchell, but made all the same stops on the way to and from. Your pictures brought back some great memories. Thanks for the Memories! I certainly can understand the itchy feet syndrome. Haha! 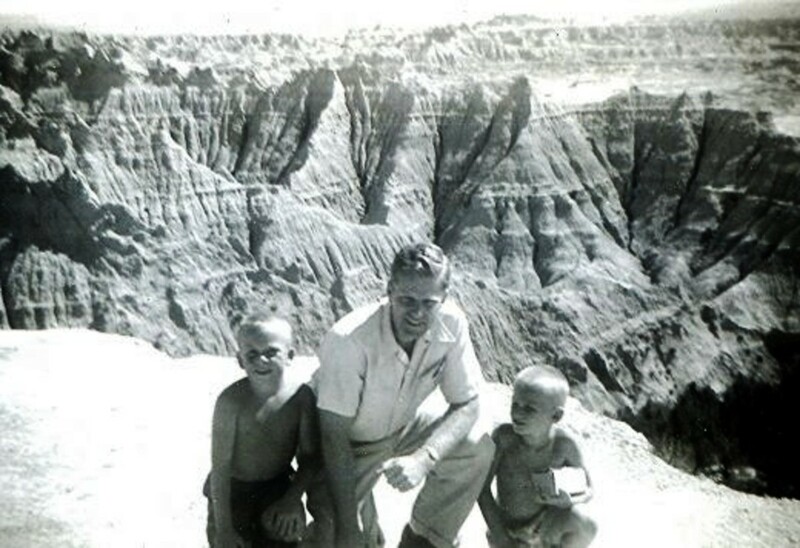 We loved our family road trip back in the 1950's to South Dakota. It was wonderful that my Dad had assembled all the pictures, maps, etc. into this scrap book so that we could enjoy it through the years. Now that it is on the Internet...others can enjoy it as well. Thanks for leaving your nice comment. 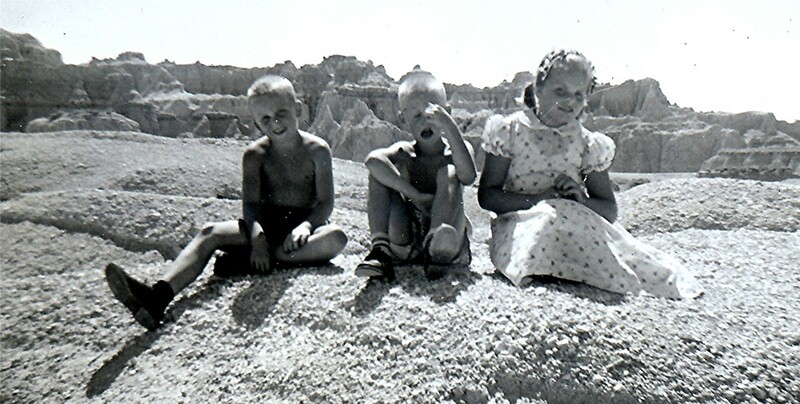 Sorry, I do not have any pictures of what you want, but perhaps by posting it here others who read about this South Dakota Trip from the 1950's just might. Hopefully someone will come across this hub and get back to you. Your second address is probably gmail.com instead of email.com. Correct? So nice to see you commenting here! Am sure if Jan checks back she will like it as well. You and your family are so fortunate to have been able to visit and revisit the same places in South Dakota including the Pine Rest Cabins multiple times. I have such fond memories! Thanks for the visit and comment. As you know I'm the cousin from Madison, WI. My kids who are now in college still think the Black Hills and the Pines Rest Cabins are some of their best memories. Stayed there with Jan and Steve numerous times and appreciated their hospitality and beautiful surroundings. Great place to vacation. Nice to meet you! 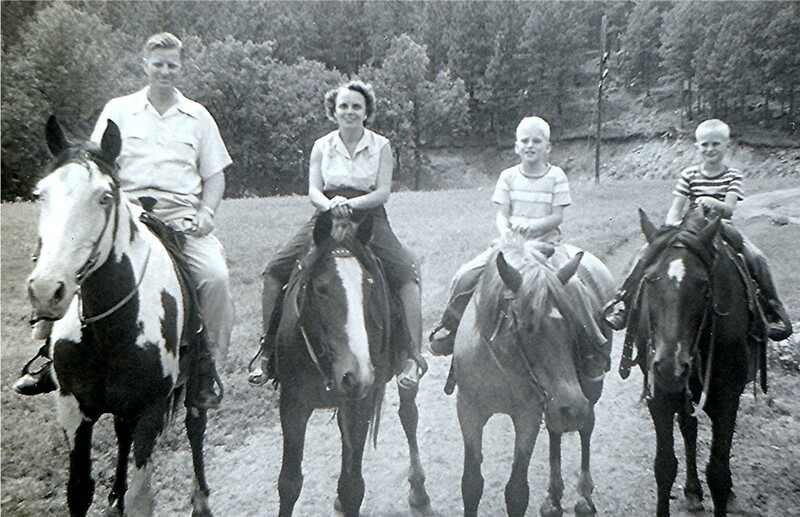 My parents had moved to Texas in 1960 but my aunt and uncle and family have returned to the Black Hills of South Dakota several times and always stayed at the Pine Rest Cabins. One of my cousins from Madison has taken his children there as well. I would love to revisit those places as an adult and would surely want to make the Pine Rest Cabins a part of that journey. My husband Steve and I are the current owners of Pine Rest Cabins. I was delighted to come upon your wonderful scrapbook including the cabins. 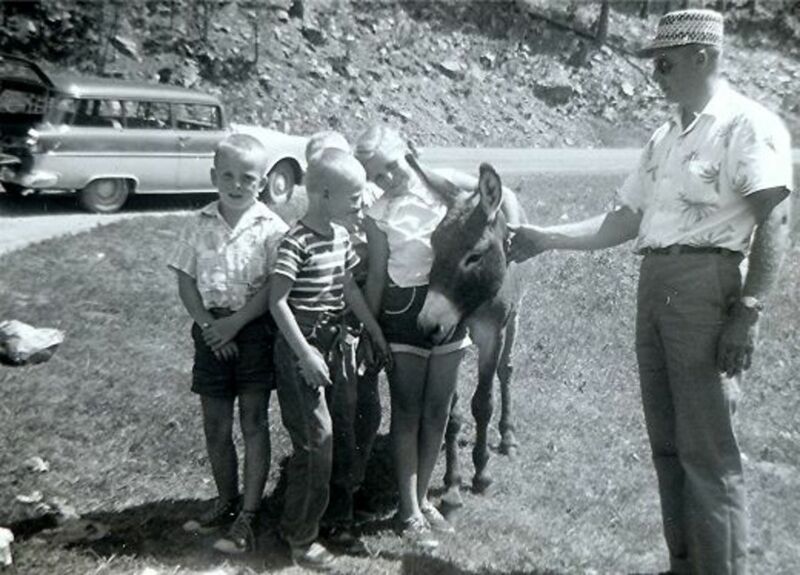 We've owned Pine Rest since 1992 and over the years I've collected a few vintage photos from local residents and returning guests, some of which are displayed at our visitor center in Hill City. We have photos of my son in the same playhouses you played in! 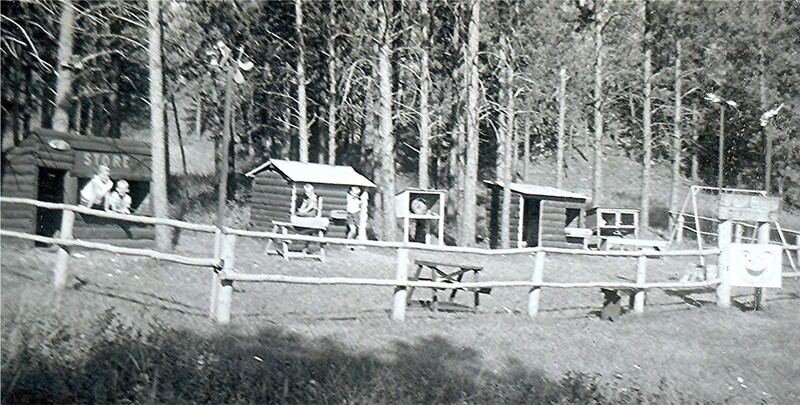 Pine Rest Cabins turns 100 in 2011 and I plan to do a scrapbook to comemorate our history. The really neat thing about your road trip photos is that most of the places you visited are still enjoyed by our guests today. With the exception of the Passion Play which closed just a few years ago, from the Corn Palace to Burros and buffalo in Custer State Park to Devils Tower, you could re-create your families' vacation - wouldn't that be a fun adventure? Very happy to hear that you are enjoying these real photos and stories from the past. 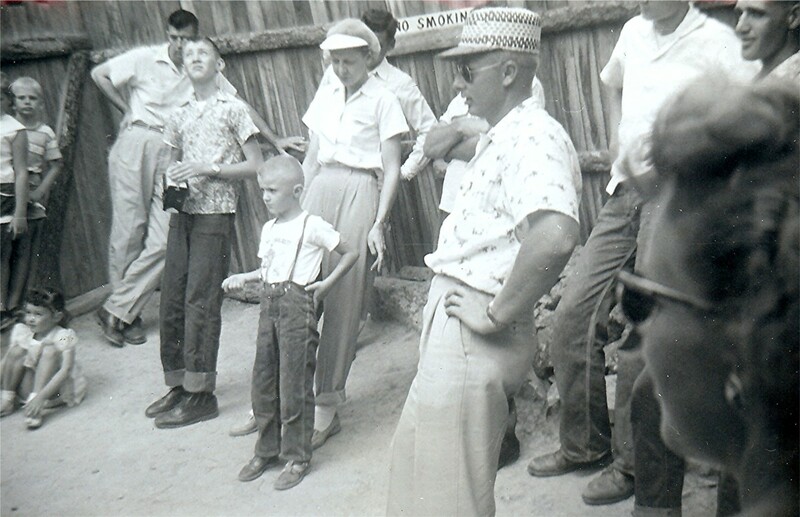 Our families really enjoyed our trip to South Dakota back in the 1950's. Thanks for the comment. This is one of the best hubs I have seen. I am only 22 years old but I love when I see pictures from the past. I love real photos from that time. You can see how different people lived and how much it has changed now. Great article.! Useful Beautiful and Amazing! 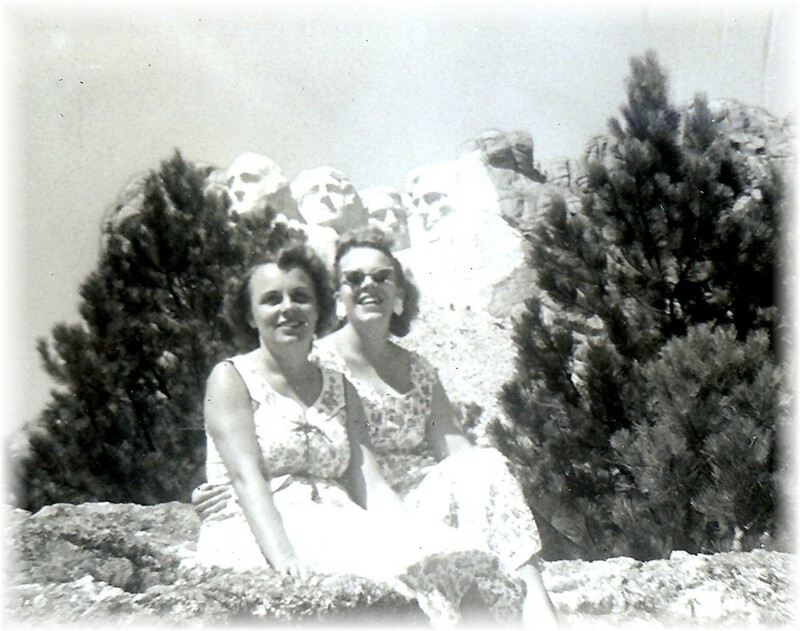 So happy that you enjoyed reading about and seeing the photos from this South Dakota road trip from the 1950's. Yes...the old phone numbers were pretty simple as were the addresses back then. I just loved reading about your 50's trip. 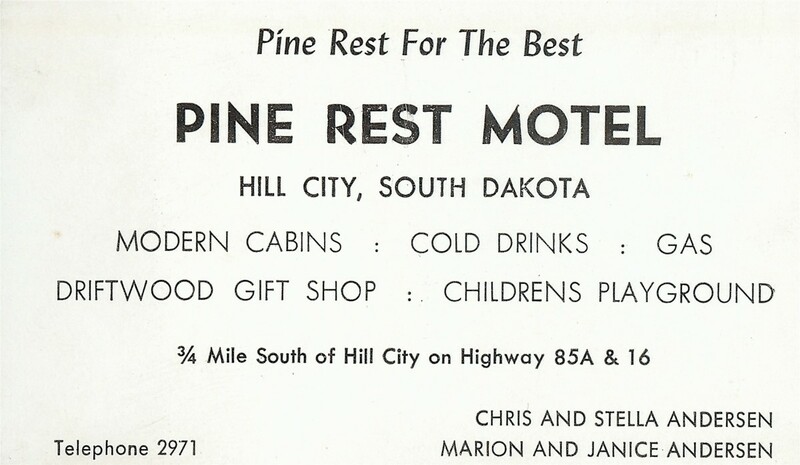 I noticed the phone number on the pine motel ad, what a riot, they actually had numbers like that! Thanks for sharing this wonderful hub. I hope that you do get to take a road trip to South Dakota with your family. Am sure it is something that they will fondly remember forever. The scenery is so spectacular and out of the norm for what many of us get to ordinarily see. Thanks for your comment. Seeing wild horses running...not many things as beautiful! You were fortunate to have seen that in your South Dakato experience. Depending upon when you went there, you might have seen more definition of the Crazy Horse monument. Our country certainly has so much to view and enjoy! Thanks for the comment. 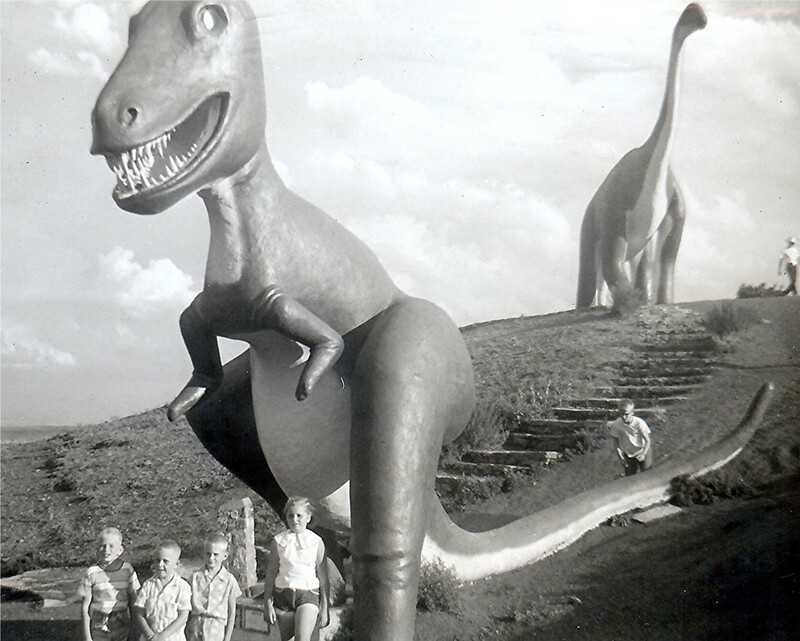 Glad you enjoyed this family vacation in South Dakota way back in the 1950's. It is a treasured memory for me and other family members. I agree with you that "There is something so special when a family goes on a road trip." Thanks for the nice comment. I needed a vacation and yours seemed perfect.So many pictures when they were very expensive to get developed.Wow thanks for bringing me with you.There is something so special when a family goes on a road trip. I also enjoy viewing the family pictures this way. So much larger than the actual photos in the album. Thanks for the additional comment. Thanks to the great scrapbook my Dad had assembled after the South Dakota and Black Hills trip, we are all the beneficiaries of this 1950's road trip with the family pictures. So happy that you enjoyed it. I can assure you that I enjoyed it also by reliving it when putting together this hub and being able to see it in this format. Thanks for your nice comment. 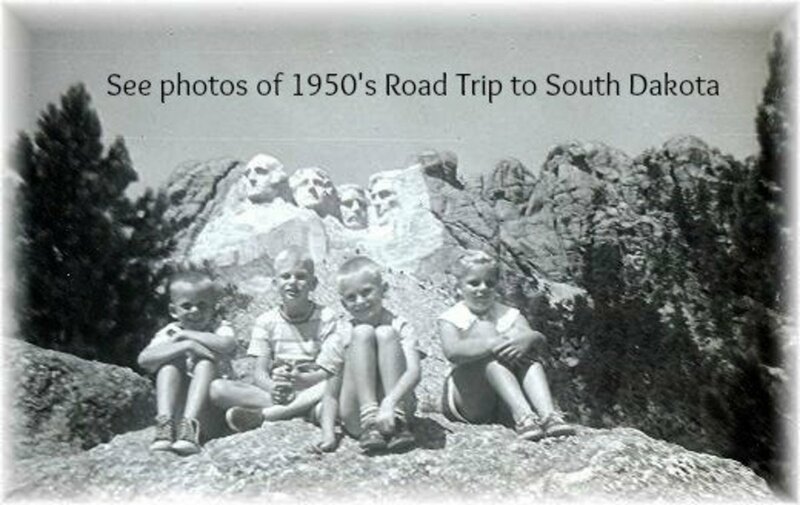 Happy to hear that you liked this 1950's road trip to South Dakota taken so many years ago with family members. As you say...now it is timeless. Thanks for the nice comment. Wow, what a wonderful idea to make a hub on trips like this one. It's priceless because it happened so long ago and now it is timeless as well. :) Thanks for sharing! How long ago did you visit North and South Dakota? Did you take pictures? Have you shared your experiences on hubpages? Glad you liked this trip down memory lane with my family and thanks for the comment. Some great pictures. I have visited North and South Dakota and have great memories from the trip. I will definitely visit again. Thanks. Actually when these photos were taken, black and white pictures were more commonly taken. Happy to hear that you enjoyed this South Dakota road trip hub and thanks for the comment. Peggy, you are so colourful and yet you chose black and white photos, but this and the photos are a great hub and your work is prolific, well done.